The Emperor Angelfish is also known as mperial Angelfish and Imperator Angelfish. It is found in tropical Indo-Pacific, the Red Sea and east to Hawaii. This fish is moderately difficult to keep and is not recommended for beginners. It should only be placed in an aquarium with ideal water conditions. Males are 16 in., females about 14 in. Adults can take care of themselves. 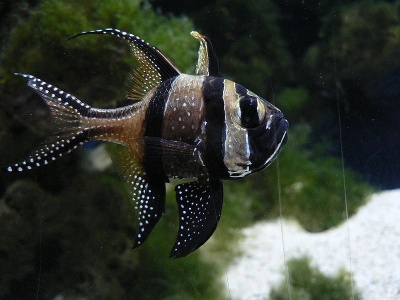 Care should be taken when introducing smaller emperors especially in aquariums with dwarf angelfish. Best kept singly. Minimum size tank if 145 gal. The tank should include plenty of live rock and hiding places. 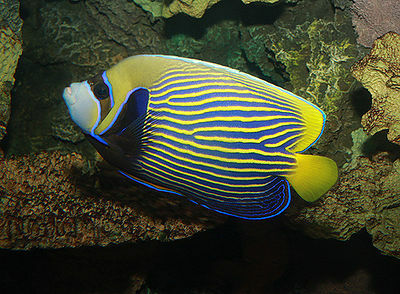 In a reef tank, the Emperor Angelfish will nip at stony corals, soft corals and clam mantles, but tends to leave somewhat noxious soft corals alone. pirulina and marine algae. It is best to feed this fish a high-quality angelfish preparation. If the diet is not sufficiently vitamin-rich, the colors of the adult fish will fade and the juveniles will not transition properly to adults.